I give you a little background on jury selection (or deselection) to put my own recent experience in perspective. The case that was to be heard that day was a DUI case, a criminal case that was a misdemeanor trial, which told me no one had been injured in the DUI incident. I don’t handle any criminal cases, so I thought I might actually be left on this jury. Fantastic! It was probably a one day trial, being tried in front of perhaps one of the most efficient (read fast) trial judges in DeKalb and so maybe, if I get lucky, I’ll get to learn what goes on in the sanctity of a jury deliberation room and it will cost only one day. This trial judge has also been a friend of mine for twenty years or so, so I knew it would be a good experience being in his courtroom Perfect! Of course, the fact that I am a plaintiff’s personal injury lawyer came out (strike against me by both sides…no one can trust a lawyer on a jury). The fact that I know a little bit about breathalyzers and how they must be calibrated to be considered reliable came out (strike against me for the prosecution…breathalyzers are notoriously unreliable). The fact that I often represent victims of DUI drivers in personal injury lawsuits came out (strike against me for the defense). The fact that I personally had had a bad experience with a City of Atlanta police officer came out (strike against me for the prosecution). But, as I tend to be optimistic by nature, I still thought those two last strikes would cancel each other out and I would be, by default, left on the jury. Voila! (Another pretentious French word used solely for literary flare here). Finally, the selection (deselection, remember) was over and the court clerk instructed us: “If your name is called please remain seated in the jury box.” So exciting! Was I the only person in the room who wanted to remain in the jury box? Clearly so, as names were announced there was a smattering of muttering that may have included expletives and other generally disparaging remarks about jury duty. Sadly, my name was not announced. What?! There must be some mistake. I would be the perfect juror for a DUI case. Would it be too obvious if I asked the court clerk to check her list again for Robin Frazer Clark? Did she accidentally skip over it? Nope. No mistake. I was free to leave the courthouse and go home. Bummer. It was clear as I gathered with the other juror outcasts waiting for the elevator that these folks all felt relieved not to be in the courtroom still and to be going home. You may often hear the lengths folks will go to to avoid jury duty. It is a common occurrence, unfortunately, in America. It is an American Jury, however, who breathes life into our Constitution. 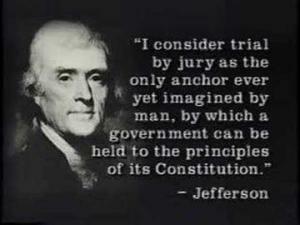 It is an American Jury that keeps us from “being ridden like horses, fleeced like sheep, worked like cattle” as President Adams put it. It is an American Jury that makes our form of self-government the envy of all the World. Maybe one day I will get to be part of one.